Last month, the Texas MBA at Houston Consulting Club, the Consulting Club at the Jones Graduate School of Business, and the Consulting Club at the Texas Medical Center hosted the first annual Greater Houston Consulting Case Competition. Ten students from the Texas MBA at Houston Consulting Club represented McCombs and came together with students from the other two organizations to form six mixed teams. Participants had 5 hours to get acquainted, analyze the case, create a slide deck, and practice their presentation. All of this preparation was then expended in a 10 minute presentation to spectators and guest judges from McKinsey, BCG and Ernst & Young. After careful deliberation, the judges announced the top-performing team, who won the $500 prize! 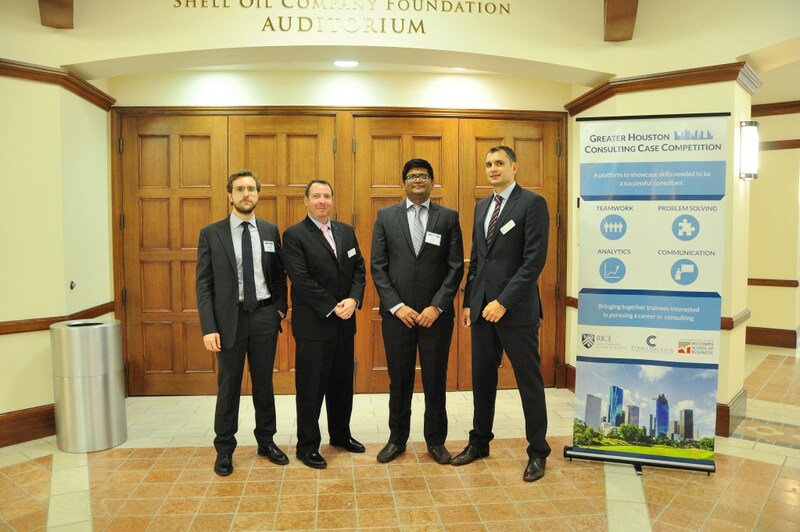 Ashutosh Shinde (MBA ’17) from McCombs, Felipe Armaza and Paul Surpenant from Jones, and Alessandro Alabastri from the Consulting Club at the Texas Medical Center were selected as the winning team of the 1st annual competition. The case centered on the future of Apple Inc., exploring three new (actual or potential) product offerings: the watch, the television, and the car. Given the current market trends and Apple’s previous successes, the teams prepared a recommendation outlining the optimal product portfolio for Apple to focus on in the near future. Teams were assessed on their ability to create, assemble, and present their recommendations to judges, founded thorough data-backed analysis and representing a practical and economically feasible business strategy for Apple to potentially implement. Judges additionally considered the team’s poise while answering questions, the creativity behind their analysis, and the level of professionalism demonstrated by the team members. Congratulations to Ashutosh and the rest of the Texas MBA at Houston Consulting Club!